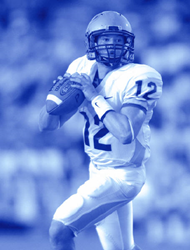 US Sports Camps and The Northeast Football Clinic offers EXCLUSIVE concentration on Quarterbacking and Receiving instructed by skilled coaches who have achieved measures of greatness both as players and coaches. The Northeast Football Clinic is the total football experience, instilling the confidence and competence required to play the quarterback and wide receiver position. US Sports Camps and The Northeast Football Clinic will be offering its Quarterbacking and Receiving clinic from Friday, July 8 to Sunday, July 10. Quarterbacks and receivers are two of the most skilled positions in the game and they demand a great deal of discipline and repetition in perfecting the skill and techniques necessary to perform at these positions. The Northeast Football Clinic is the total football experience, instilling the confidence and competence required to play the quarterback and wide receiver position. The clinic teaches proper training and conditioning techniques to maximize each athlete’s physical fitness, while minimizing the risk of injury. Breakout sessions include topics on the importance of academic grades for college recruitment and scholarship opportunities, the 2016 NCAA Clearing House Rules and Regulations, viewing college training films, classroom lectures and chalk talks. This teaching clinic is held on the campus of the Lawrence Academy in Groton, MA, where students are housed in the dorms and play on the outstanding facilities this school has to offer. Director Alex Rotsko has 36 years of coaching experience at the high school and college levels. Three years ago he became head football coach at Marshwood High School in Maine. His teams have posted a 30-5 record. They have played in two state championships and three Western Maine Championships. The Clinic’s objective is to help developing athletes reach their highest potential. For more information, visit http://www.ussportscamps.com/northeast. US Sports Camps (USSC), headquartered in San Rafael, California, is America’s largest sports camp network and the licensed operator of Nike Sports Camps. Over 75,000 kids attended a US Sports Camp program in 2015. The company has offered summer camps since 1975 with the same mission that defines it today: to shape a lifelong enjoyment of athletics through high quality sports education and skill enhancement. Athletes, Coaches, Parents and others interested in learning more about our 2016 Nike Sport Camp programs can visit our website at http://www.ussportscamps.com or call 1-800-645-3226.